A pool float that resembles a giant inflatable sanitary pad has sparked a discussion on social media about the unfortunate design. 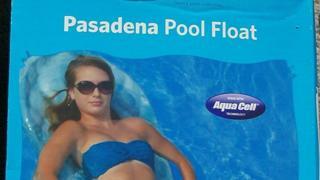 The picture was first posted on social media site Reddit three days ago with users joking about the Pasedena Pool float's seemingly unintentional resemblance to a feminine hygiene product. One Reddit user remarked: "It gives me the confidence I need to float in the pool." But it was when the photo of the giant lilo pad was shared by Jillian David on Twitter that users questioned how such a design could've been commissioned. "This could have been avoided with 1 focus group (of women) she posted." The tweet has been shared 19,000 times (and counting) since being posted on Monday evening by baffled social media users. One Twitter user posted: "Alternative theory - it was designed by a woman who was sick of the men in her family stealing all the pool floats." Another remarked: "This is not going to be a hit with their (probably) intended consumer group. Which could have been avoided simply by including them." Others replied with what they believed were also unfortunate designs. While others failed to see the humour. "Are we supposed to be ashamed of menstrual products? Is it not ok that other products allude to them, unintentionally or otherwise"